6.14 points at 14 votes (rank 602). Life on a building site is hard. 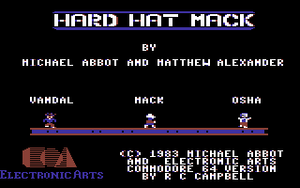 This learns the "Hard Hat" builder, the hard way in this early single screen platformer. While Mack just tries to do his job, different enemies aggravate his life. At first there is the industrial safety company, represented by an officer of the OSHA. Then a "vandal" runs over the building site every now and then. And the worst are as always the own colleagues, as already in level 1 one of them shoots around with a stud gun out of sheer presumption. 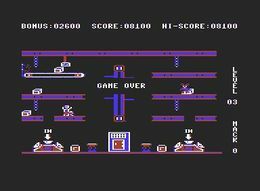 Course of the game and controls: Mack is controlled with a joystick in port 2. 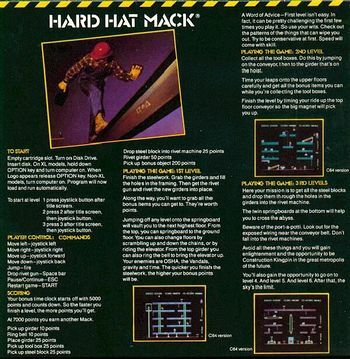 With left/right Mack walks, up/down is used for ladders, and with the fire button he jumps. Items as elements of steel beams, air hammer, tools etc. are picked up by contact. The enemies must not be touched. 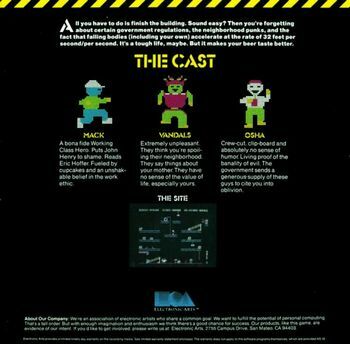 It is possible that there are several enemies of the same type (OSHA, vandal) in one level. There are three levels in which different tasks need to be done (see hints below). In the later levels other items appear that Mack must not touch. If there is no trampoline waiting, Mack must not fall or jump into the depth or he will break his neck. The faster Mack works, the higher will the bonus at the end of the level be. Graphics: At that time it was almost normal that platformers were held in coloured contrast on black background, compare with The Goonies, Dino Eggs, Jumpman or also Burger Time. 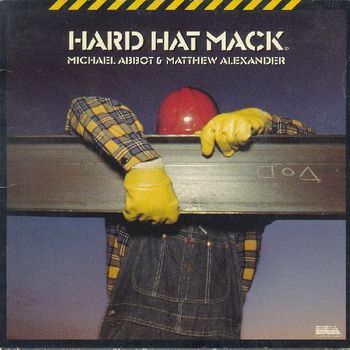 One must almost praise Hard Hat Mack graphically for the fact that blue, brown, white and purple dominate the screen and that no more exotic colours have been used. This mixture is a bit unconventional, but there were bizarrer graphics at that time. Sound: The possibilities of using the SID chip were not far developed in 1983. Therefore, the player had to be content with a unisonous, sometimes rather shrill tootling as background music and passably successful FX. Unfortunately, there are no options for sound, but this was not common at that time. Level 1: The elevator at the left side of the screen must only be entered and can then be controlled with up/down. The trampoline at the right side must be reached by a jump and lifts Mack one plaftorm higher or to the lowest platform if he jumps from the uppermost platform. Important: First collect all missing steel beam parts and put them into the gaps, then finally pick up the air hammer, as you cannot put it down any more. If it runs towards you, you can jump over it. When all gaps are closed, Mack must walk over the corresponding parts with the air hammer. If he has managed to do this without running into the arms of OSHA or vandal and without falling down, the level is finished. Level 2: You need to jump on and off the conveyor belts at the right moment without getting hit by the steel slag (bottom) or jumping into the flame (top). Mack has to collect six toolboxes. He can reach the different platforms by jumping on a steel beam hanging from a crane in the middle, which goes up and down in turns. When all boxes have been collected, Mack needs to reach the right beam on the highest platform. This is tricky and needs some timing and skill. Mack needs to jump up and down on the upper conveyor belt so that a magnet grabs his helmet and carries him to the end position. If this is successful, also level 2 is finished. Level 3: Here Mack needs to throw six steel blocks into two machines marked with "IN", which then form them to rivets. The pater-noster-like conveyor belt in the middle and the two trampolins can be used to move between the two platforms. Be careful with the conveyor belt at the upper left, you must not go with it to the end, but have to grip the ladder or Mack will die. When all steel blocks have been stamped, the last level and with this the game is over. With the hints above, there should be no problem with level 1. If you cannot find the right way or correct course in levels 2 and 3, you should watch the videos listed in the section "Links" below. Robotron2084: "Has probably to be evaluated as a try by Electronic Arts to take a ride on the Donkey Kong- or Miner 2049er-wave sloping over at that time. 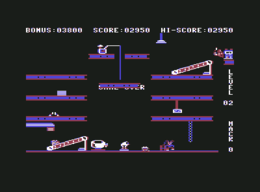 The same as with Last Gladiator and Axis Assassin, which had originally been developed for the Apple II, they did not make the effort to refurbish the graphics for the C64. Of course, this gets visible in bold and blurred four-coloured graphics. I still remember well how frustrated I was at that time, when the required pixel-exact jumps just wouldn't be successful, because the screen was so blurred. Only 25 years later in the emulator these positions can be recognized and behold: this is a tolerably useful oldskool platformer. 6 out of 10 points." TheRyk: "Drunk on the site... nice, little game, but tricky. It's a pity, that (as rightly mentioned by my previous speaker) the 1:1 C64-conversion has been done rather sloppily and lovelessly. Probably only the true nostalgics can take pleasure in the bulky, shrill graphics and the psychedelic sound, especially when hearing the jingles my ears hurt. 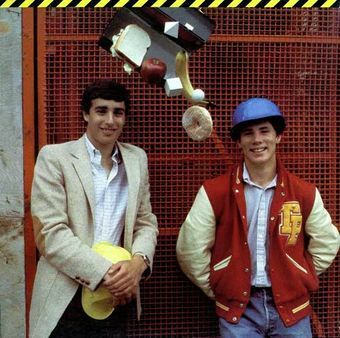 The Blue-Collar-Worker or Hero-At-Work story was a funny idea for a plot aorund a platformer. But considering the year of publication I also give 6 out of 10 points. Because the game is just cult and I like taking it out of the shelve once in a blue moon. But there are also better platformer from the time, e.g. Lode Runner." The original version was made for the Apple II, portations for other home computers followed soon. The programers Michael Abbott and Matthew Alexander. Notice the cube, ball and pyramid (the logo of Electronic Arts) that fall out of the lunch box. This page was last modified on 3 March 2019, at 18:50.